Pat Fitzgerald speaks to the media on Friday. His Wildcats will face Ohio State in the Big Ten title game Saturday. INDIANAPOLIS — As Pat Fitzgerald stepped off the bus at Lucas Oil Stadium on Friday afternoon, it didn’t take long for him to realize that the spotlight here is brighter. When Fitzgerald next arrives at the 70,000-seat indoor behemoth in the heart of this city, he’ll lead the Wildcats into one of their most significant tests in years: Saturday’s Big Ten Championship Game against vaunted Ohio State, a national heavyweight and the No. 6 team in the country, with a berth to the Rose Bowl on the line. Despite the stakes, unfamiliar setting and unusually late kickoff — 8:17 eastern time — Fitzgerald said his team wanted to keep preparations as close to a regular road game as possible. He spoke with his Leadership Council about several “thought-provoking” topics, from uniforms to the itinerary, but also the weekly attitude. Northwestern, nevertheless, faces a litany of tests against the Buckeyes. Quarterback Dwayne Haskins earned conference offensive player of the year honors, Ohio State is the defending Big Ten titleholders and Urban Meyer’s team has an outside shot at the College Football Playoff. Meyer, for his part, pointed to special teams as a likely flashpoint in Saturday’s contest. The Buckeyes excelled in that regard in last week’s 62-39 decimation of Michigan, allowing the East Division champions to score frequently on short fields. Challenges aside, Fitzgerald expressed optimism in his team. He pointed to bowl victories each of the past two seasons and NU’s 6-0 record against Big Ten West teams this season. He seemed characteristically unbothered by being the underdog, and sarcastically thanked the media for playing up that narrative this week. 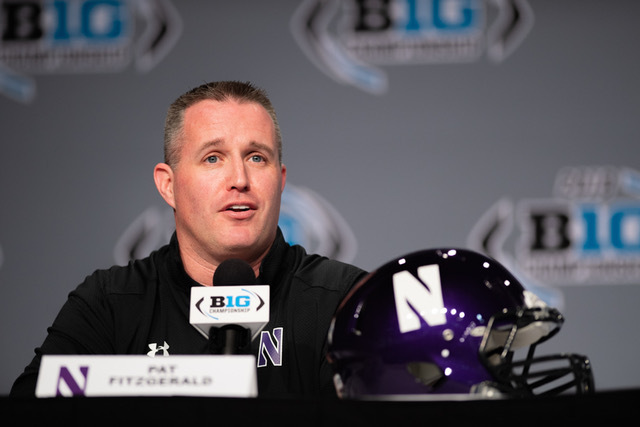 Fitzgerald spoke at length about his two decades in Evanston, from playing for Gary Barnett in the 1990s to taking over the program 13 years ago. Now, more than a dozen years after taking the helm, Fitzgerald has his team on the cusp of a major breakthrough.